Memorial Day is a day set aside to honor Veterans who gave their lives for this country and to a certain extent, men and women who are active in the U.S. Military. It's not just about chillin' and grillin', however, it is the day we use to signal that summer is right around the corner--so we blend the two. I heard that the end of May was chosen because it was thought that by that time, flowers would be in bloom all over the world. Former POW Cpl. Joseph Hudson (right) presented the then U.S. Military Academy Commandant Brig. Gen. Leo Brooks with an American flag on behalf of all who serve and those who have made the ultimate sacrifice to defend our nation's freedom during the 2003 pre-game events of the 104th Army-Navy football game in Philadelphia. Brooks now works for another branch of the U.S. Government. A 10th Mountain Division Soldier uses binoculars to look for enemy activity while a fellow Soldier unfurls an American flag near the village of Loy Karezak, Afghanistan. U.S. Army photo by Spc. Gul A. Alisan. 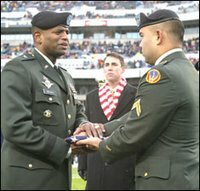 This photo appeared on www.army.mil. In 1866, Congress and President Lyndon Johnson declared Waterloo, N.Y., the birthplace of Memorial Day. There, a ceremony on May 5, 1866, honored local veterans who had fought in the Civil War. Businesses closed and residents flew flags at half-staff. Linda Patterson, founder of America Supporting Americans, applauds the U.S. Army Drill Team during a Twilight Tattoo in her honor on the White House Ellipse. Brig. 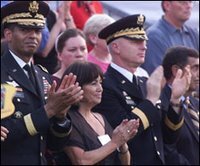 Gen. Vincent Brooks, chief of Public Affairs, applauds on left and on the right is Military District of Washington Commander Maj. Gen. Galen B. Jackman. But what about Fleet Week? I was led to believe it was a time to be as friendly as possible with all of the seamen. According to Wikipedia, the free encyclopedia,Fleet Week is a United States Navy, United States Marine Corps and United States Coast Guard tradition in which active military ships recently deployed in overseas operations dock in a variety of major cities for one week. Once the ships dock, the crew can enter the city and visit its tourist attractions. At certain hours, the public can take a guided tour of the ships. Often, Fleet Week is accompanied by military demonstrations and airshows such as the Blue Angels. Well, it all seems like a fine reason to celebrate to me. Pull out the grills, balance the veggies with the pork, beef and fish and have all the fun you want. Brig. 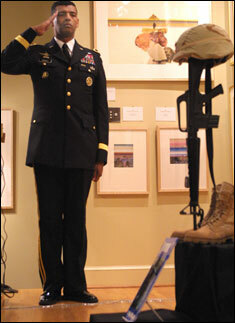 Gen. Vincent Brooks salutes a fallen Soldier display for Sgt. DeForest Talbert, an Alexandria native who was killed in Iraq this year while on patrol. Talbert was memorialized during a Veterans Day program at Alexandria's Black History Museum. These days were set aside for Americans to enjoy being in this country because of the hard work of many who have come before us. That would be Africans brought over from Africa enslaved then later freed, European, Hispanic, and Asian immigrants who willingly traveled to this country and anyone else who wants to be here. 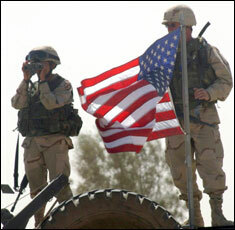 Because of those who gave their time and lives in the U.S. Military, we get to chill and grill, kick back and enjoy. Just don't forget who made all of this possible. Whooweeee Barry Bonds is the Man! $40,000 per year the new Poor?